This is one of my favorite pictures ever taken. The next face on Jewish Mount Rushmore would be the ever-present scowl of Larry David. He is the spirit animal of just about every Jew you could ever meet, old man or not, from Brooklyn or not. I could have chosen Jerry Seinfeld for this slot, but Larry David resonates much further. Maybe its because his sense of humor goes beyond merely observational, or maybe because he at first did not get all of the public spotlight during the “Seinfeld” years. That is not even a problem now, as David is now the star of his own show. Every year seems like it is going to be the last year of “Curb Your Enthusiasm.” But then, it always comes back for another season. Good. Let’s keep it that way. I feel like everyone needs “Curb” in their lives. 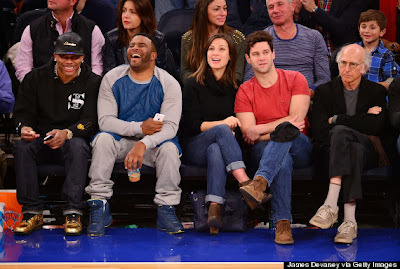 Larry David is like a social cop, always making everyone aware of what social standards are complete B.S. Essentially, society as we know it would crumble without Larry David. It still amazes me how popular Larry David is, because on television he portrays a cynical curmudgeon (who, let’s face it, is essentially what he is in reality). Larry doesn’t try and get anybody to like him, which is also why he is ultimately so likable. There is something dangerous in David’s sense of humor. He doesn’t try to play it safe. He revels in the art of calling people out. And it would be meaner if all of his observations weren’t so true. All of us would love to elevate small talk to medium talk and tell that woman in line in front of us at Ben & Jerry’s that she’s a sample abuser. Larry David simply says the kind of things that we are all thinking, but never blurt out because, you know, social standards and politeness. Larry David is a free and uninhibited man. There is something about Larry’s sense of humor that is ultimately very Jewish. The Jewish state of mind can best be summed up by non-Jew John Mulaney, who once said that “Jews don’t daydream because folks are after them.” Larry David is overly present, enough so that he can spot everything going on around him, process it, and then call out whoever he wants. Whether he likes it or not, this is how Larry David became a modern Jewish icon. Yet, Larry David is not just an idol to the Jews. “Seinfeld” and “Curb Your Enthusiasm” are both touchstones of American comedy. I guess that close-talkers and chat-and-cutters are a universal problem after all. This entry was posted in Comedians, Comedy, Curb Your Enthusiasm, Hanukkah, Jerry Seinfeld, Jewish, Jews, Larry David, Seinfeld on November 30, 2013 by ian0592.